The Calibra® Digital Reading Manual 822 Micropipettes, 832 Macropipettes and 852 Multichannel pipettes are equipped with a twin-cam system fitted with pre-calibrated steps providing for true digital volume entry and numerical display. Fast volume setting without winding. The air displacement single channel Calibra 822 micro-pipettes, Calibra 832 Macropipettes and Calibra 852 8-Channel and 852 12-Channel pipets come with all the good features of the new Socorex instrument generation. These include slim ergonomic design, ultra-soft plunger stroke, and unsurpassed shock, heat, chemical and UV-light resistance. The Calibra 822 pipettes are available in a wide selection ultra-micro volumes and micro sizes to 1,000 µL. 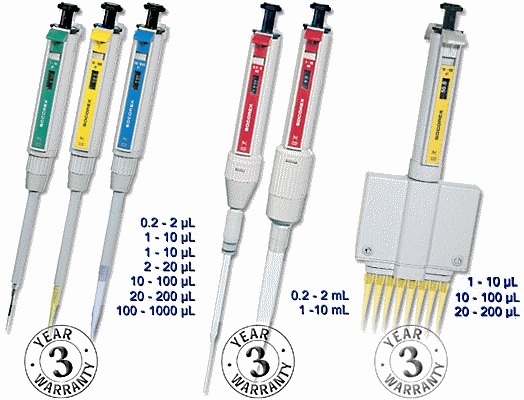 The single channel Calibra 832 macropipettes are available in 2 mL and 10 mL volume sizes. Five models of the Calibra digital 852 8 and 12 channel micropipettes cover a range from 10 to 200 µL. In this illustration volume can be changed from 10 to 50 µL in half a revolution of the setting wheel that is in its normal position against the pipet body. For fine tuning, in this case from 50 to 55.5 µL, it takes a half revolution of the setting wheel that is in a position pulled away from the pipet body. 320.336 Unique design 6 position pipette Work Station 336 for 3 pipettes, fits all Calibra and Acura pipettes as well as most other brands. Rotates, available in seven translucent colors including Rubin red, Topaz orange, Citrine yellow, Emerald green, Sapphire blue, Quartz grey and Diamond white. 320.340 Multi and single channel versatile Work Station 340 for 3 pipettes, fits all Calibra and Acura pipettes, made of light grey polyamide, stable and easy to clean. 320.337 Universal Work Station 337 for up to 7 single channel micropipettes, of most brands. Very stable, made of easy to clean polyamid material. Blue, green,,rose and yellow pastel colors available.